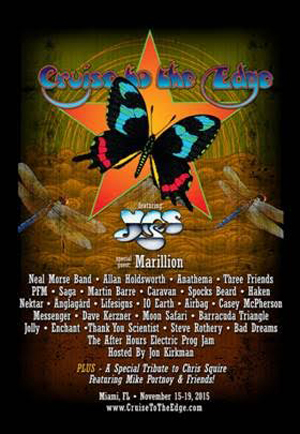 On course to sell out for the third-year-in-a-row, the 2015 CRUISE TO THE EDGE--the annual YES fan cruise and ultimate prog rock experience sailing the Caribbean this November 15-19--announced a few updates today (8/6), including: the addition of MIKE PORTNOY, NEAL MORSE BAND and HAKEN to the artist line-up; confirmed an all-star tribute and musical farewell to beloved bassist and founding member of YES, the late Chris Squire; and two new payment options designed to make it affordable for prog rock enthusiasts to attend this historic event. Fans may secure their spot aboard the cruise for only $499 USD per person (details outlined below). The third annual five-day, four-night cruise will feature multiple stages of progressive rock music from the iconic and GRAMMY-winning rock band YES, special guest MARILLION and 25-plus bands, aboard the NCL Pearl. A new addition to this year’s cruise itinerary is a special pre-cruise event, complimentary to all cruisers, on Saturday, November 14 at Magic City Casino in Miami, before setting sail to crystal clear Bahamian waters, visiting Key West and Great Stirrup Cay, Bahamas. The special pre-cruise concert will feature an IPA beer tasting, artist meet and greets, performances from Martin Barre of JETHRO TULL, THREE FRIENDS and LIFESIGNS, as well as an after-hours “Electric Prog Jam,” where passengers become the stars, playing instruments to selected prog rock songs. Legendary progressive rock bands YES and MARILLION will lead an all-star lineup aboard this year’s cruise (with most artists playing at least two sets), including the just-added acts (iconic drummer Mike Portnoy; Neal Morse Band and Haken), plus Anathema; Allan Holdsworth; Three Friends; PFM; Saga; Martin Barre, Caravan; Spocks Beard; Nektar; Änglagrd; Lifesigns; IO Earth; Airbag; Casey McPherson; Messenger; Dave Kerzner; Moon Safari; Barracuda Triangle; Jolly; Enchant; Thank You Scientist; Steve Rothery; Bad Dreams and AHEPJ. It will all be hosted by UK journalist and preeminent YES expert, Jon Kirkman. Portnoy will act as official “music director” for an all-star tribute to beloved bassist and founding member of YES, the late Chris Squire. Portnoy will be joined on stage by many friends of Chris in this musical farewell to one of Progressive Rock’s Greatest Performers. Besides the great musical performances, prog-rock music fans will get a chance to participate in special events and activities, including: “Storytellers” style concerts featuring behind-the-scenes stories from select bands, showcasing their writing/recording style and process, band history; Prog Panel Q&A Sessions; Meet & Greets; Bon Voyage Sail-Away Concert and more. In addition, Multiple Performance Stages throughout the ship will keep the action going into the wee hours with a surprise or two along the way. Finally, cruise attendees will be able to enjoy the ship's 13 bars and lounges, various eateries, casino, spa, fitness center, basketball and volleyball court, bowling alley and more. EZ PAY PLAN: This special no interest installment plan is designed to assist fans who need an extended installment option in order to attend. While supplies last, fans may secure their spot aboard the cruise for ONLY $499 USD per person down (double occupancy), with the remaining balance payable over twelve equal monthly installments beginning the month after the initial reservation is completed and debited on the 15th day of each month (or next business day). Click HERE for more information. PAID IN FULL PLAN: For those who prefer to pay their cruise fully in advance, a 5% discount off the base fare is available. Fans will save money and have the peace of mind of knowing that their cruise is squared away and fully paid for.